Send warm and spring-filled greetings, even in the midst of winter! 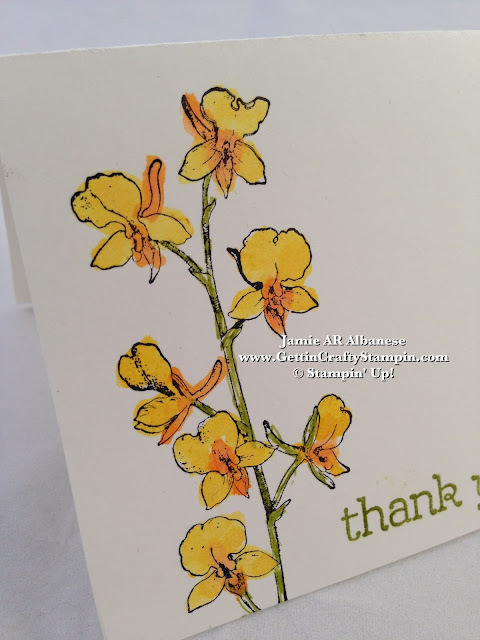 Hand-stamped cards can deliver flowers, sunshine and more even to areas snowed in! Here is a cute, clean card that is sure to brighten someone's day! *Receive YOUR OWN New Occasions Mini (starts TODAY - June 1, 2014) and a hand-stamped gift from ME! 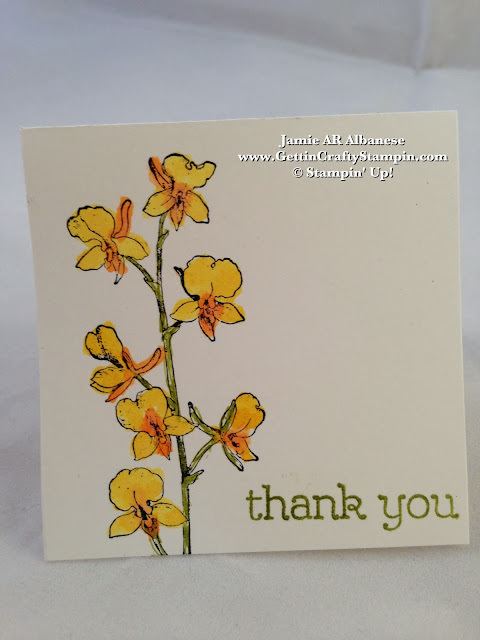 Simply email me at Jamie@GettinCraftyStampin.com your name, number and best time to call... I will contact you to send you your own hand-stamped card! Color in the beautiful and delicate blossoms with a dash of Pumpkin Pie to the center of the flower. Our Stampin' Write Markers make it easy to color with the two tips! Shade in with the brush side for a soft look. 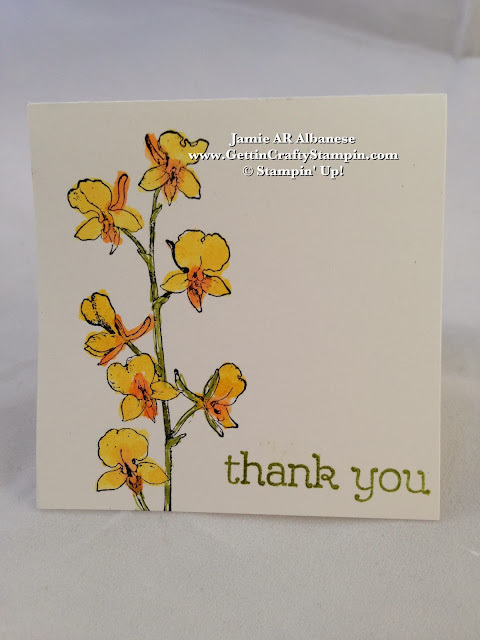 Color the outside of the blossoms with the Daffodil Delight Stampin' Write Marker. This two-toned flower is lovely, isn't it? Using the pen tip to the stem so that the color stays within the lines. Watercolor look to this Happy Watercolor stamp set with the Stampin' Write Markers while securing strong colors. Using the brush side to color the 'Thank You' sentiment from this stamp set and apply a coordinating greeting to this cute card! You light up my day with your coming by! Please come back and often (get MORE of Gettin' Crafty Stampin' when you join my Exclusive Mailing List). I try to post projects and tutorials daily - bring your friends and family along for the ride and Share Me! Send a Hand-Stamped card and Celebrate SPRING while sending some cheer - even in the midst of snow-filled winter (well, it isn't snowing here is So. California - we are a cozy 76* today - sigh). Missing family and friends who live in the blustery cold of the mid-west, east coast and Canada... I can't wait to send them some cheer and a dash of SPRING!